Specific Requirement: The applicant for a PUD shall provide the following information. Given the amount of information needed it is recommended that the plan be developed and refined through several conceptual /preliminary iterations with the staff and Planning Board. Many of these items may be presented as approximations or preliminary estimates subject to change, where appropriate. Specific Requirement: Present underlying zoning classification and zoning classification of all adjoining lots. See TND 2 and Figure Z1 Map of Present Underlying Zoning Classifications below (Project hatched); zones are AR-1, C-1, CR-II, CR-III, IND-1. TND 2; click for larger image. Figure Z1; click for larger image. Specific Requirement: Topographic and other information on the tract including soil types, wetlands, surface water, land contours, natural and cultural resources, ridges and knolls, rock outcrops, steep slopes, etc. 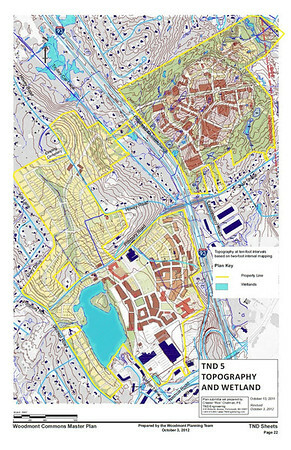 This information may be presented in an overview format, in less detail than would be required of a site plan or subdivision application provided that a clear sense of the tract is conveyed sufficient to evaluate the PUD proposal (for example, wetlands need not be professionally delineated if potentially wet low lying areas are roughly indicated). 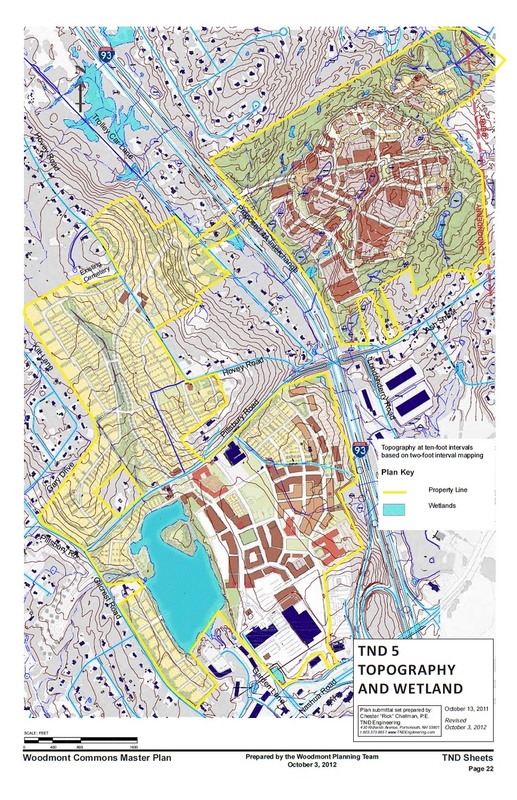 Topographic information on the tract including soil types, wetlands, surface water, land contours, ridges and knolls, rock outcrops, steep slopes are shown in overview and with some specificity on TND 5 and TND 11. There are a limited number of stone walls and the PUD abuts an existing cemetery, but otherwise there are no other known cultural resources. Topography is generally rolling and soils vary on both sides of Route 93. Soils data may be found in detail online: http://websoilsurvey.nrcs.usda.gov/app/HomePage.htm. TND 5; click for larger image. TND 11; click for larger image. Specific Requirement: Total acreage of the tract; rough delineation of each land use area with approximate acreage. See TND 3. The Project comprises approximately 625 acres. TND 3; click for larger image. Specific Requirement: Proposed uses for each land use area, preferably given with some specificity. See TND 3 and TND 12 where Use Areas are depicted with the areas and differing uses labeled, and the list under 4. Proposed Land Use List (2.8.9.1.4) and on TND 4 that summarize this information. TND 12; click for larger image. TND 4; click for larger image. In the Project, both the Small Hotel and PUD Bed and Breakfast uses are allowed as principal uses. In PUD Bed and Breakfast facilities, the only full meal service to be provided guests shall be breakfast, and it shall only be served to guests taking lodging in the facility (lodgers). Afternoon and evening tea service and cocktails are also permitted for lodgers and their guests. Small PUD Hotels may provide full meal services. The principal structures comprising both Small Hotels and PUD Bed and Breakfast facilities shall be constructed to emulate larger residential homes. There is no limitation on stay duration for individual guests at a particular PUD Small Hotel or PUD Bed and Breakfast establishment. 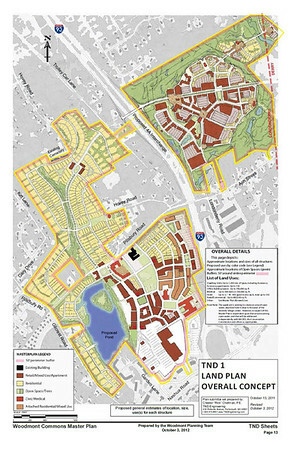 Use Zones E-1 and W-1 are anticipated to be different in nature, with W-1 containing more mixed-use walkable neighborhoods and locations. E-1 will also be walkable and mixed-use, but it may contain larger buildings for larger commercial tenants and owners. 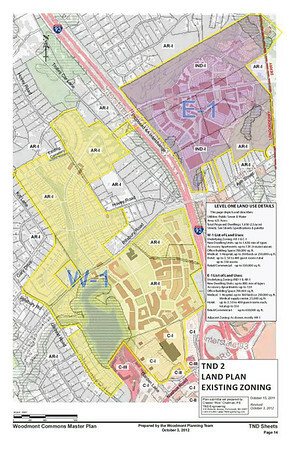 Within Use Zones E-1 and W-1, any use may change its location, so long as the structure(s) and character of the proposed use remain substantially the same. 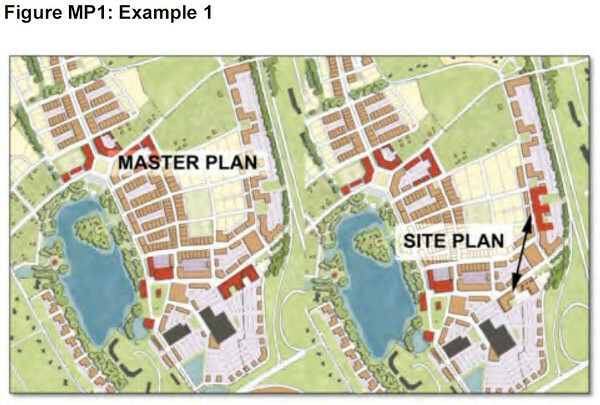 As a pair of examples, in the following diagrams, the large red building on a Master Plan moves northeast, becomes larger, and is replaced by more mixed-use buildings where it was originally proposed. MP1; click for larger image. Such changes are consistent with the flexibility inherent in a planned unit development and therefore do not require a Master Plan amendment. The Master Plan documents also establish the overall maxima. Street alignments depicted on the Master Plan are not final, and both the alignments and types of streets may change during Site Plan and/or Subdivision Plan stages of the Project. A pair of illustrated plans follows, and by these terms and definition, from a Master Plan perspective, they are the same, and are also the same as the currently proposed Master Plan. MP2; click for larger image. Specific Requirement: Proposed total number of dwelling units and overall residential density for the tract (if applicable). 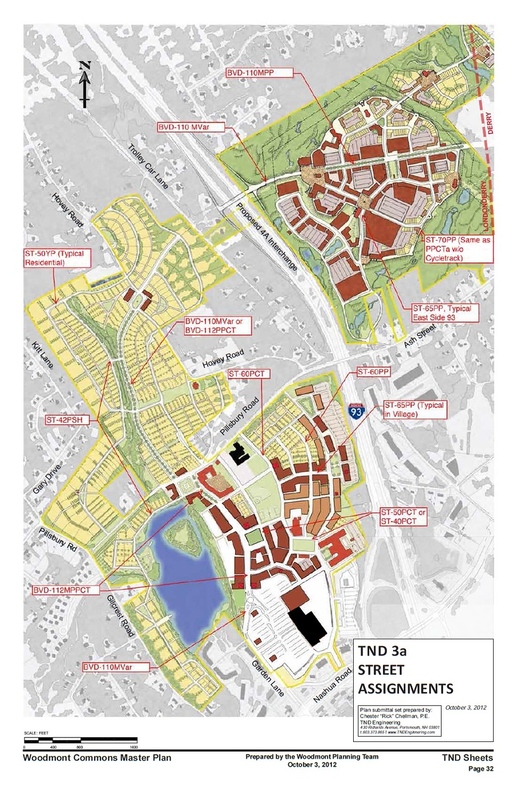 See TND 1 and TND 2; up to 1,300 dwelling units plus up to 130 Accessory Apartments on approximately 625 acres which equates to 2.3 units/acre. TND 1; click for larger image. In order to encourage the creation of significant new neighborhoods of mixed uses, ages and incomes, except as outlined in the Applicant’s response to section 2.8.9.2.14, and so long as the Project is Revenue Positive there shall be no annual growth limits on the number of residential units nor any limits on building permits for residential units. Accessory apartments shall be allowed throughout the Project, and such units shall count toward the maximum dwelling unit limitations. 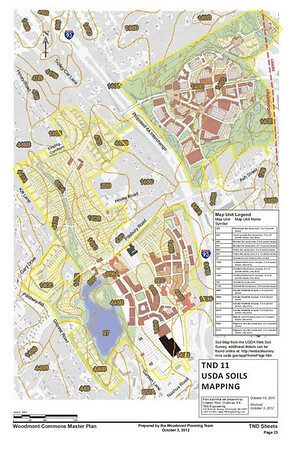 Residential uses shaded yellow on TND 3 around the perimeter of most of W-1 shall remain residential and generally as depicted on TND 1. However, if additional land is added to the Project so as to make all or any portion of this shaded land internal to the Project, then changes with a Master Plan Amendment are permitted so long as residential use is maintained along adjacent residential lots. Specific Requirement: Proposed general estimates of location, size, use(s) for each structure. See TND 1 and photographic examples herein. The westerly portion of the Project is expected to have more of a village component; the easterly side of Route 93 may have larger buildings and mixed-uses. By way of additional description, an area designated as “Retail/Mixed-Use/Apartment” is an area that is predominantly retail, then mixed-use, then apartments; an area designated as “Attached Residential/Mixed-Use” is an area that is predominantly residential with a mixed-use component – physically, these two areas will be very similar. All commercial site plans, multi-unit dwellings, condominiums and zero-lot line buildings in the Project shall have their as-built locations measured and drawn on surveys suitable for recording at the Rockingham County Registry of Deeds. Since the entire PUD will be developed in a computer-aided drafting system (CAD) and since boundaries between units will be combinations of: both interior and exterior building walls; ceilings; roofs; basement areas; and, conventional lot lines there will be no requirement to conventionally monument every boundary. Provided, however, that single family home parcels located in perimeter parcels in Use Zones W-2-5 through W-2-7, W-2-9 and W-2-11 shall have their lot lines monumented with rebar or other suitably permanent markers. Property lines in the Project may have any alignment. There are no minimum frontages or maximum lot coverage provisions in the Project except in the yellow shaded residential Use Zones W-2-5 through W-2-7, W-2-9 and W-2-11 where lots shall generally be as depicted on TND 1. 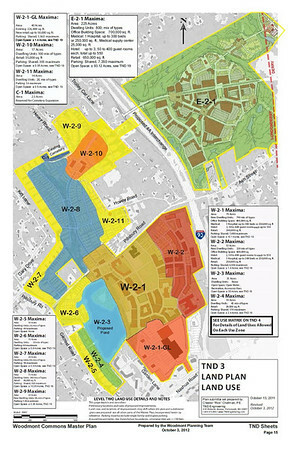 There are no minimum Front, Side or Rear Setbacks requirements in the Project except in the yellow shaded residential Use Zones W-2-5 through W-2-7, W-2-9 and W-2-11 where lots shall generally be as depicted on TND 1 and buildings will generally be located in the central portions of lots, and Rear Setbacks shall apply. Except for portions of Buildings not designed for human habitation or occupancy such as steeples, belfries and clock towers, Building Heights may not exceed fifty feet (50’). Office Buildings may only be located along the Route 93 corridor, hereby established as those portions of the Project within 1,000 feet of the Route 93 Right-of-Way or within E-1. Specific Requirement: Proposed general estimates of location, width, and materials of all streets, drives, sidewalks, and paths. All streets, alleys, boulevards and other thoroughfares in the Project will be in general conformity with the spirit and intent of this document and the exemplar streets depicted in the Project Street Specifications and Palette (SSP) in Appendix 3. The Board, as a part of site plan or other review of a specific proposal, may allow street types in addition to the exemplars shown in the SSP. Streets in the Project will not be classified according to conventional functional classification nor subject to any requirements pertaining to such classifications. Streets and pathways may have surface treatments that are not asphalt and may include brick, cobblestone, and for pathways, crushed gravel or decomposed granite. Additional surface treatment materials may also be used as appropriate for the neighborhood. Also see TND 1, TND 3A and the Street Specification Palette in Appendix 3. 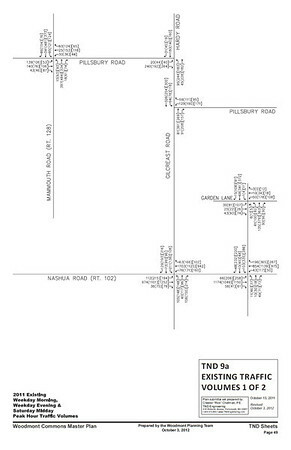 TND 3a; click for larger image. Each driveway providing site access from a street or other public Right-of-Way shall be designed, constructed, and properly maintained in compliance with the following. The Board may waive the requirements of this Section. 1. Single-family dwellings and duplexes. No limitations on drives. 2. Multi-family and nonresidential projects. a) A multi-family or nonresidential development project on a parcel of two acres or less shall be limited to a maximum of two driveways, unless the Board determines that more than two driveways are required to accommodate the traffic for the project. b) Whenever a property has access to more than one street, access should be generally be directed to the lower volume street. 2. For parcels with frontages of less than 150 feet, the minimum distance shall be 75 feet. D. Driveway spacing – Driveways should be separated along a street frontage as follows. 1. Single-family and duplex residential developments. Driveways should be shared or separated by six feet. 2. Multi-family and nonresidential developments. Where two or more driveways serve the same or adjacent multi-family or nonresidential development, the centerline of the driveways should be separated by approximately 40 to 50 feet. The Board may approve exceptions to this standard, and this guideline does not apply to parking structures or lots located inside blocks. E. Driveway dimensions – Dimensions and sight distances shall adhere to reasonable safety protocols and this Master Plan. 1. The nearest edge of a driveway curb cut shall be at least two feet from a property line unless it is a common driveway and three feet from the centerline of a fire hydrant, light standard, traffic signal, utility pole, or other similar facility. G. Traffic safety visibility areas – Trees, street lights, pedestrian wayfinding systems and other amenities are encouraged along all streets in the Project. There are no limitations on the placement of these features or buildings near any signalized intersections. Around unsignalized intersections, structures or landscaping are allowed, provided they do not create significant obstructions to pedestrians or excessively block drivers’ vision; trees are always permitted with their lower canopy trimmed up to a minimum of 5 feet from the ground within 75 feet of an unsignalized intersection. H. Intersection Spacing – Intersections may be as close as 75’ for two-way streets and 50’ for one-way streets, measured centerline to centerline. I. Street Rights of Way – In order to allow buildings to better shape the spaces along streets and around intersections, street Rights-of-Way may meet without connecting radii. Specific Requirement: Proposed general estimates of location and number of spaces for each parking area. See TND 3 and TND 6. The area west of Route 93 as currently shown depicts approximately 1,500 striped on-street spaces and another 3,550 of offstreet per level of parking. Easterly of 93, the plan shows approximately 1,600 striped on-street spaces and another 2,600 per level of off-street parking. TND 6; click for larger image. All parking in the Project shall be in conformance with the Project parking criteria and guidelines. This section is intended to provide a comprehensive set of parking and loading criteria. Provide flexibility in accommodating changes in demand and use. 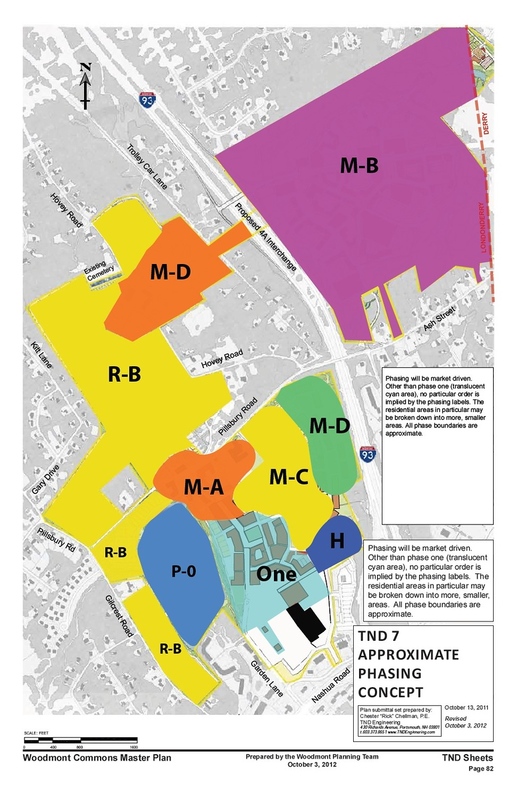 Parking required – Unless waived or modified by the Board as a part of the site plan or other review of a specific proposal, each new PUD building and new land use, including an expansion of a building or land use, will provide parking in compliance with this section. Basic space requirement – Each land use shall provide the number of parking spaces outlined in Table AP, as applicable, except where the requirement is reduced or otherwise changed in compliance with the Reduction of Parking Requirements. If a land use shares its parking publicly (i.e. not reserved), it shall provide parking consistent with the “shared” requirement rows in Table AP. 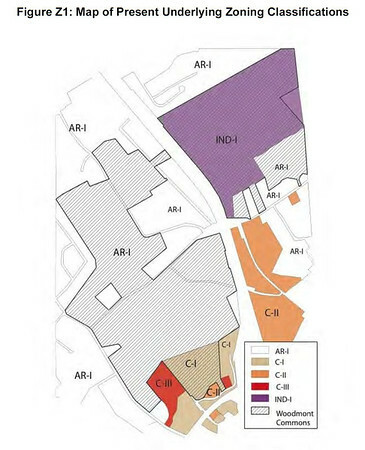 If a land use reserves its parking exclusively for that use alone, it must provide parking consistent with the “reserved” requirement rows in Table AP. Single-family detached dwellings shall provide two spaces per dwelling. 1. On-street Parking – Except in the Use Zone W-2-1GL, generally, continuous head-in or parallel parking will be provided along streets where Commercial uses predominate. It is Applicant’s intent to allow parallel along most other streets. 2. Parking Space Allocation – For other than Shared Parking, parking spaces may be considered allocated to a particular Lot, or use, if those spaces are entirely on that Lot or the use of the spaces has been assured by assignment through easement or other legal guaranty. On-street parking may be allocated to a particular Lot when a particular on-street space abuts a particular Lot. Where an on-street space abuts more than one Lot, a particular parking space may be allocated to a particular Lot only if more than 66% of the space abuts that Lot or if that space has otherwise been legally assigned to that Lot or use. On-street parking shall be counted toward fulfilling parking requirements. See also the phased development provisions for temporary parking in the Reduction of Parking Requirements below. 3. Disabled (ADA) Parking – Parking for the disabled shall be provided on site in compliance with applicable Building Code Standards. Parking spaces required for the disabled shall count toward compliance with the number of parking spaces required by this Chapter. 4. Use with Accessory Components – A single use with accessory components shall provide parking for each component. For example, a hotel with a restaurant shall provide the parking spaces required by Table AP for a hotel (e.g., the guest rooms), and for a restaurant, except where the requirement is reduced or otherwise changed in compliance with the Reduction of Parking Requirements below. 5. Expansion of Structure – For additions or enlargements of existing buildings or uses that would increase the number of parking spaces required, the additional parking shall be required only for such addition, enlargement or change, and not for the pre-existing building or use. 6. Change in Use – For any change of occupancy or manner of operation that may increase the number of parking spaces required, no additional parking shall be required unless the Board determines that the change in use without added parking would create a negative impact for neighboring properties. 7. Excessive Parking – The Applicant will discourage a use from providing more parking spaces than the maximum number allowed in Table AP, in order to avoid the inefficient use of land, unnecessary pavement, and excessive storm water runoff from paved surfaces. The maximum number of spaces allowed varies based on whether spaces are to be reserved for on-site tenants and visitors, or to be shared parking. This creates an incentive to share on-site parking, particularly among development with the capacity to provide extra parking – a management strategy that has proven effective in reducing cumulative parking needs within commercial centers. By encouraging the sharing of these larger facilities, nearby uses will be able to reduce their own estimated parking needs. The higher maximum option also provides important flexibility to encourage development within infill areas. 8. Floor Area – Where Table AP expresses a parking requirement based on gross leasable area (for example: 1 space for each 1,000 GLA), the term “gross leasable area” shall mean gross leasable square footage of floor area. Gross leasable floor area is the total building area designed for tenant occupancy and exclusive use, including any basements, mezzanines, or upper floors. It is the area for which tenants pay rent; it is the area that produces income, as defined by the Institute of Transportation Engineers (ITE). 9. Parking Type – Where Tables E and W express a parking type, the term “shared” shall mean parking that is publicly available and “reserved” shall mean parking that is reserved exclusively for the use of those occupying the land use. 10. Use Zones – Where Table AP references Use Zones, see the TND 3. 11. Rounding of Calculations – If a fractional number is obtained in calculations performed in compliance with this Chapter, one additional parking space shall be required for a fractional unit of 0.50 or above, and no additional space shall be required for a fractional unit of less than 0.50. A parking lot with 100 or more vehicle parking spaces shall provide motorcycle parking spaces conveniently located near the main entrance to the primary structure and accessed by the same access aisles that serve the vehicle parking spaces in the parking lot. A. Number of Spaces Required – A minimum of one motorcycle parking space shall be provided for each 100 vehicle spaces or fraction thereof. B. Space Dimensions – Motorcycle spaces shall have minimum dimensions of four feet by seven feet. The number of parking spaces required by Table AP above may be reduced or modified through the following measures or any combination of measures. A. Shared Parking – Where two or more uses utilizing the same parking have distinct and different hours of peak parking demand (such as a theater and a bank), the required minimum number of parking spaces may be reduced by up to the number of spaces required for the least intensive use. B. Waiver of Parking – The Board may reduce or waive the minimum number of parking spaces required based on quantitative information provided by the Applicant that documents the need for fewer spaces (e.g. sales receipts, documentation of customer frequency, information on parking standards required for the proposed land use by other cities, etc.). C. Waiver of Parking: Off-Hour Uses – The Board may reduce or waive the minimum number of parking spaces required for a land use that has a peak parking demand that does not coincide with the general peak parking demand (generally considered the evening peak period). D. Waiver of Parking: Transportation Demand Management – The Board may reduce or waive the minimum number of parking spaces required based on quantitative information provided by the Applicant that documents a reduction in parking demand from transportation demand management measures. 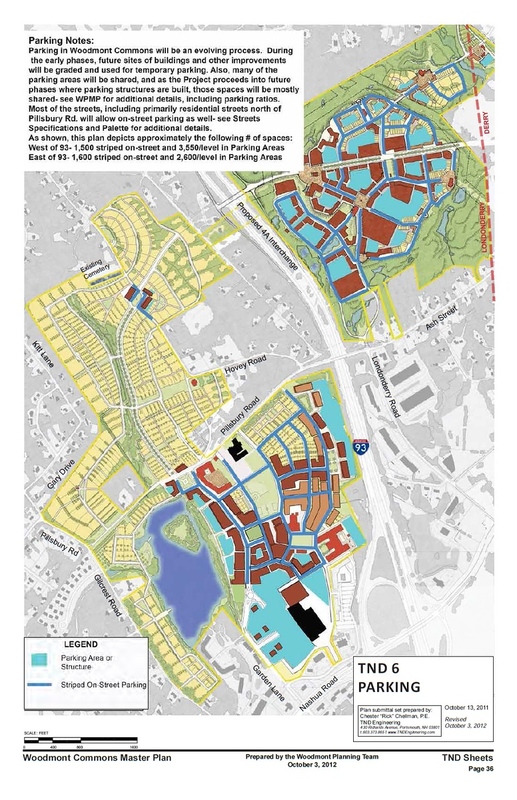 E. Phased Development, Temporary and Off-site Parking – Due to the lengthy buildout time period expected for Woodmont Commons, future sites of buildings may be graded and prepared for use as temporary shared parking areas. Any such temporary parking areas that are assigned to earlier phases of development in Woodmont Commons may substitute for future structured or other parking as may be designated, assigned and shown to the Board by the Applicant. 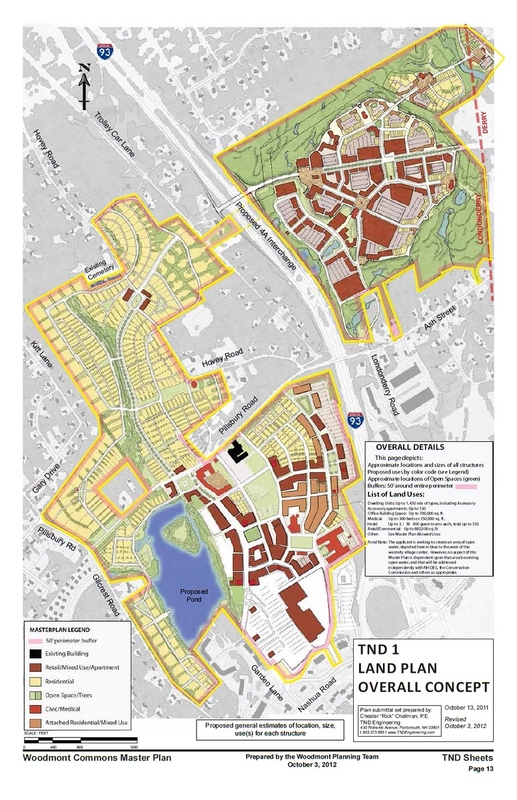 This provision is specifically intended to allow early and especially smaller phases of development to have smaller amounts and even no off-street parking areas on the developed parcel. F. Buildout Ratios/Park-Once – In Use Zones W-2-1 and W-2-2, as well as in any future areas of similar character, uses will change over time and parking shall not be required to be updated for every change of use provided: the overall parking ratio is in the range of 2.2 or more spaces per thousand square feet of commercial GLA; the residential density does not exceed 15 units/acre; parking is shared; and no use is more than 1,500 feet from a shared off-street parking facility. The purpose of this is to encourage the establishment of future “park-once” areas where patrons and others arriving by vehicle will park one time and then walk amongst many uses. Each multi-family residential use and all nonresidential uses are encouraged to provide bicycle parking in compliance with this section. The Board may waive any bicycle-related provision herein. A. 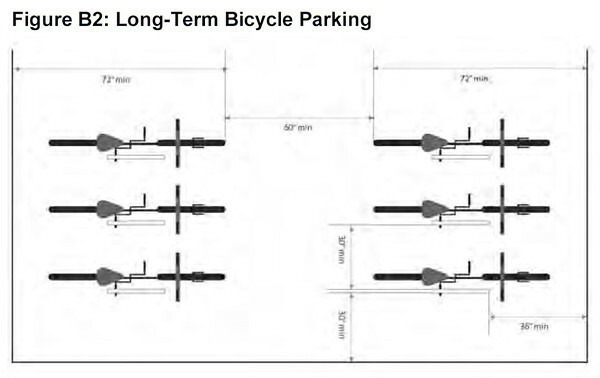 Bicycle Parking Standards – Bicycle parking should be designed for both short-term and long-term needs. The bicycle parking requirement may be met on site or may be exempted based on nearby shared facilities. 1. Short-Term Parking is intended for bicycle trips where bicycles will be left for a short time period (generally less than 2 hours). It requires a high degree of convenience and should be located as close to destinations as possible. 2. Long-Term Parking is intended for bicycle trips where bicycles will be left for a longer periods of time (generally for several hours, overnight, or seasonally). Long-term bicycle parking is intended to serve the needs of commuters and residents, but not retail patrons. B. Number of Bicycle Spaces – A reasonable number of bicycle parking spaces should be provided based on the nature of the proposal at hand and the number of automobile parking spaces required for the use. 1. Except in Use Zones W-2-1-GL and E-2-1, surface parking lots shall generally not abut any streets other than alleys and should generally be located behind buildings. 2. Except in Use Zones W-2-1-GL and E-2-1, parking, including parking garages, should generally be accessed from an alley or secondary frontage when practical. 3. Pedestrian entrances to all parking lots and parking garages should be directly accessible from the sidewalk. B. Access to Adjacent Sites – Adjacent off-street parking areas on adjacent properties are encouraged to have vehicle connections to provide for convenience, safety, and efficient circulation. Shared pedestrian access between adjacent properties is also strongly encouraged. C. Parking Space and Lot Dimensions – Parking lots and stalls should be designed with the following ranges of dimensions. D. Off-Site Parking – All projects may locate required parking away from the site of the proposed use. 1. Location of Parking – Permanent off-site parking should be located within 600 feet of residential uses and within 1,200 feet of nonresidential uses if on parking lots or within 1,500 feet of a shared parking garage for any use, unless otherwise approved by the Board. 2. 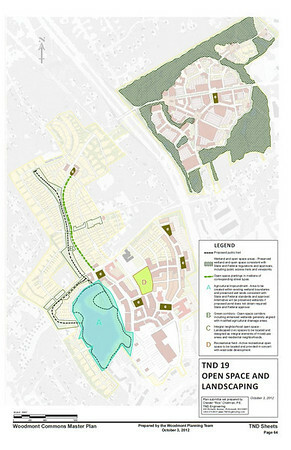 Evaluation of Proposal – In considering a request for off-site parking at distances greater than those above, the Board may consider whether adequate provisions, such as shuttle service, adequate pedestrian facilities and street crossings, have been provided to bring people from the parking to the site. 3. Guarantee of Continued Availability – Long-term required parking spaces that are off-site may be committed by a recordable lease, deed, or other easement agreement, acceptable to the Town, and which shall run with the land. E. Tandem Parking – Tandem parking (vehicles parked front bumper to back bumper) is permissible in private parking lots, areas or garages where all tandem parking is attendant directed on a full-time, year-round basis. 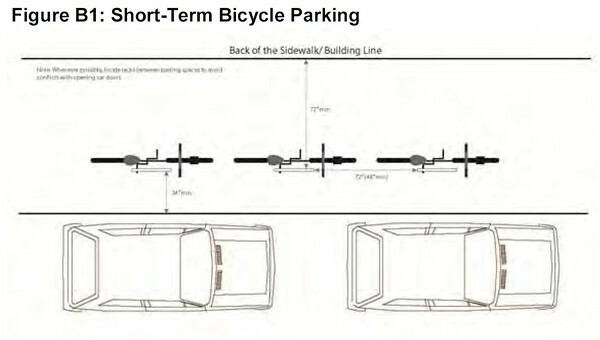 Vehicles may be parked in tandem where the parking area is serving a single dwelling (including dwellings in multiple-family developments when both tandem spaces are assigned to the same unit) and where the tandem parking is not more than two cars in depth. The Board may grant approval of tandem parking for nonresidential developments if the Applicant demonstrates that it will not interfere with orderly parking and movement of vehicles. 1. The Board may also approve mechanical parking lifts when an attendant or valet parking agreement is provided. Proposals for mechanical parking lifts shall be on a case-by-case basis to assess their functionality and safety. F. Maintenance – All permanent off-street parking spaces and driveway areas shall be paved and maintained for the duration of the use requiring such areas. Snow and ice should be removed promptly from all required off-street parking and driveway areas. Temporary parking areas may be paved or have a crushed gravel or equivalent surface. G. Landscaping – Parking lots may be landscaped in compliance with the following guidelines. 1. Amount of Landscaping – Except for parking lots within the interior of blocks, where no landscaping is required, each parking lot shall provide landscaping within and/or around the parking lot at a minimum ratio of 5 percent of the gross area of the parking lot. 2. Location of Landscaping – Where required, landscaping shall be evenly dispersed throughout each parking lot. Orchard-style planting (placement of trees in uniformly-spaced rows) is encouraged for larger parking areas. 1. On-site snow storage will not generally be required, and snow removal will be considered a collective effort of the Project except in perimeter, single-family residential lots where homeowners and tenants will be responsible for snow removal. 2. No snow storage is required where the Applicant provides means of melting the snow using underground heating elements or other, similar, means of removing the snow. Shared on-street loading areas are permitted and encouraged in the denser parts of the Project, in particular Use Zones W-2-1, W-2-2 and W-2-10 and any other areas of similar character. Off-street loading spaces are encouraged. The Board may modify these guidelines, where it is determined that the operating, shipping, and delivery characteristics of the use do not require the number or type of loading spaces required by this section, or that adequate shared on-street loading spaces are provided. A. Number of Loading Spaces – Off-street loading spaces guidelines are as follows. Guidelines for uses not listed shall be determined by the Board based upon the guidelines for comparable uses. Loading zones in mixed-use areas shall be shared. 25,001+ square feet 1 for each additional 25,000 square feet plus additional as required by the Board. 35,001+ square feet 1 for each additional 25,000 square feet plus additional as required by the Board. 1. Dimensions – Loading spaces should be 8 to12 feet in width, 20 to 40 feet in length, with 10 to 14 feet of vertical clearance. d) Situated to avoid adverse impacts upon neighboring residential properties. 3. Loading Ramps – Plans for loading ramps or truck wells shall be accompanied by a profile drawing showing the ramp, ramp transitions, and overhead clearances. a)Loading spaces shall be striped, and identified for loading only. b) The striping and “loading only” notations should be continuously maintained in a clear and visible manner in compliance with the approved plans. a)All loading areas may be surfaced with asphalt, concrete pavement, or comparable material as determined by the Board and shall be graded to dispose of all surface water to the satisfaction of the Board. Specific Requirement: Summary of proposed traffic impact, including preliminary estimates of trip generation, trip distribution and potential areas of off-site transportation improvements. 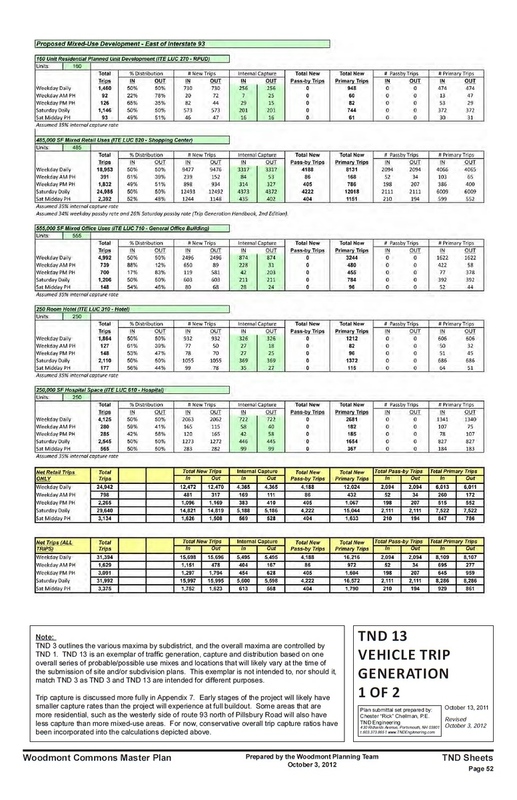 The most current edition of the ITE’s Trip Generation shall be used as a starting point for trip generation calculations for traffic analysis purposes. 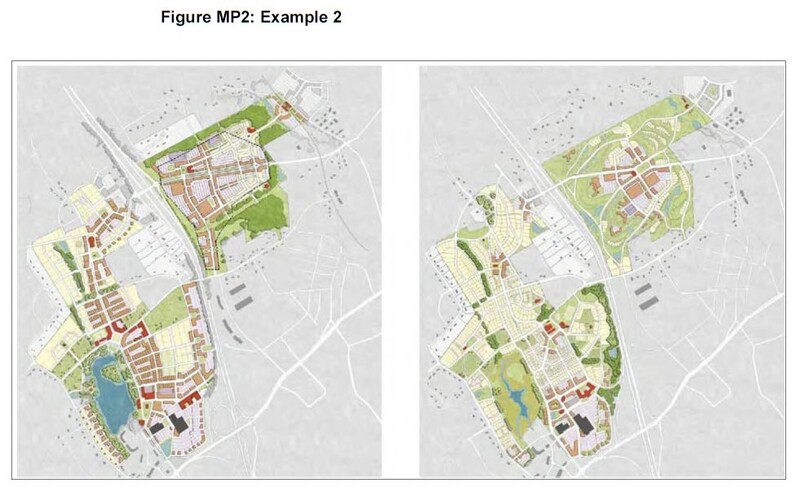 However, since mixed-use walkable neighborhoods such as the Project produce fewer trips than do the same land uses if assembled in a “suburban” fashion, the Applicant will reference the best available data to calculate an internal “capture” rate to account for: walking trips; bicycling trips; transit use, telecommuting and the like. The capture calculations will incorporate the existing and proposed land uses, and percentage of trips “captured” is anticipated to increase over time so that areas like W-2-1 may approach a 50% capture rate. Also see TND 8, TND 9A, TND 9B, and TND 10. An online case study can be found here. Please also see Appendix 7 for the case study City of Portsmouth, New Hampshire Traffic/Trip Generation Study, White Mountain Survey Company, 1991 and Appendix 8 for additional traffic data. It is reasonable to expect that many trips to the PUD will be shared between multiple land uses within the PUD. For example, someone living in the residences may choose to shop at the retail or eat at the restaurants within the PUD. Therefore, a reduction in the overall trips experienced on the adjacent roadways can be anticipated as a result of multiuse trips that include stops at more than one use within the PUD. 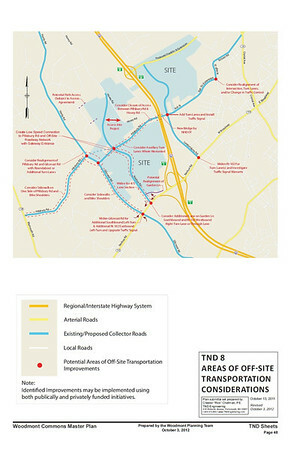 The trip estimates were quantified for each individual use and then adjusted for the percentage of trips that are expected to stay inside the boundaries of the project as an element of “internal capture.” The internal capture rates were obtained from empirical data and analysis for other mixed-use developments similar to the proposed PUD. 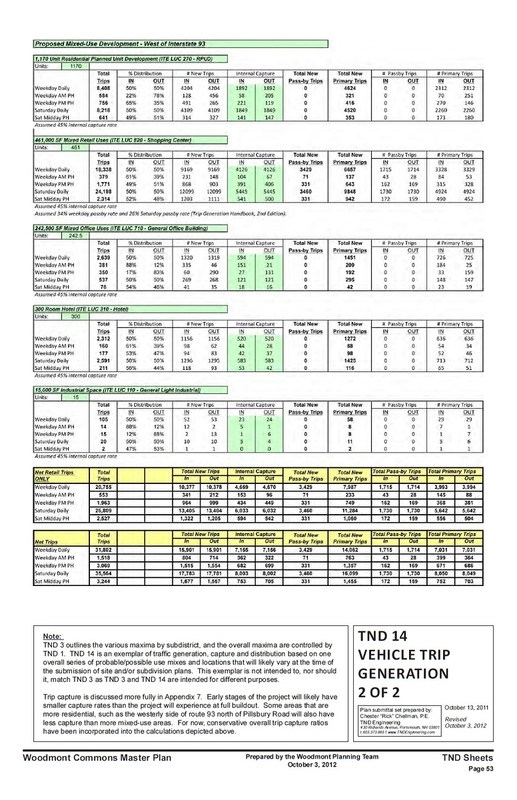 A copy of the extensive research associated with the shared trip characteristics, as summarized by TND Engineering, and other trip generation worksheets are provided in Appendices 7 and 8. Many of the retail and restaurant trips generated by the proposed PUD are already present in the existing traffic flow passing by the PUD. For example, some vehicles which are already on the roadways may decide to visit the PUD on their way to another destination. These vehicle trips are known as “pass-by” trips and are subtracted from the total trips to calculate the total primary (or “new”) trips that affect the volume of traffic within the study area away from the PUD. Based on information contained in the ITE publication Trip Generation Handbook, 2nd Edition, approximately 26 to 34 percent of the traffic generated by the proposed retail portion of the PUD is expected to be pass-by traffic. The distribution of site-generated traffic volumes from residential land uses was based on U.S. Census journey-to-work information for residents living within the Town of Londonderry. The distribution of site-generated traffic volumes from office uses was based on journey-to-work information for employees working in the Town of Londonderry. The distribution of site-generated traffic volumes from retail uses was based on a gravity model, which contains information on population in surrounding towns, competing opportunities, and travel time to/from the PUD. 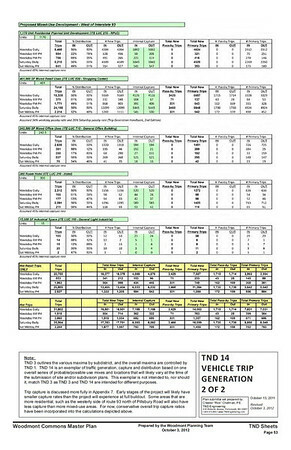 A series of detailed worksheets to document the expected trip distribution characteristics are provided in Appendix 8. The resulting trip distribution percentages are graphically depicted in TND 13 and TND 14 for the retail, office, and residential land uses respectively. 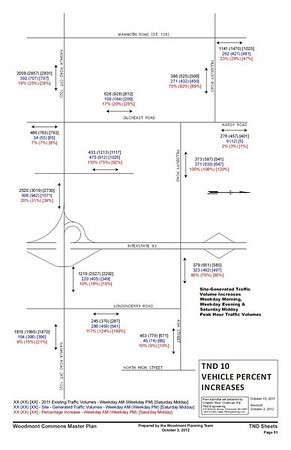 The site-generated traffic-volume networks are presented in TND 9A and TND 9B. 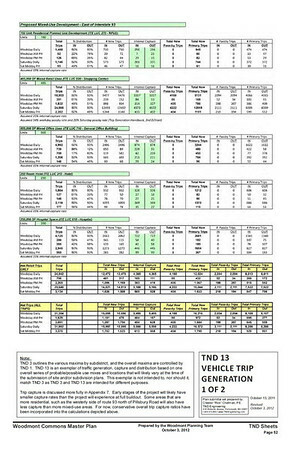 Vehicle trip distributions can be found on TND 15, TND 16, and TND 17. TND 8; click for larger image. 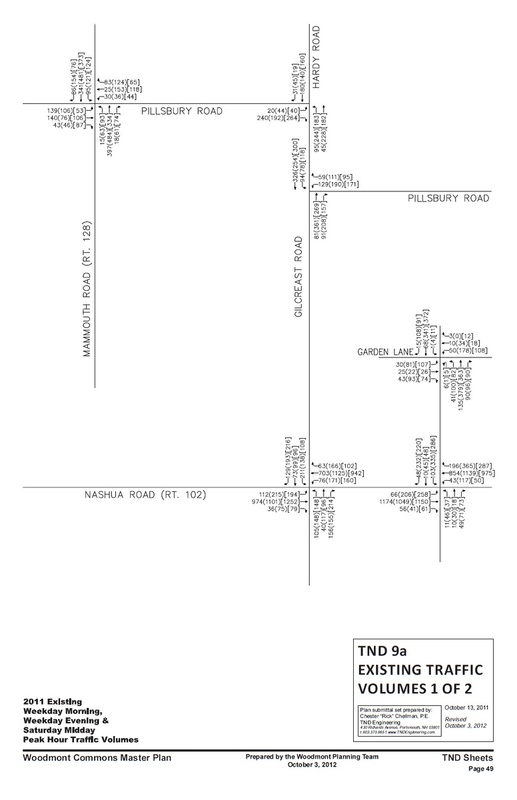 TND 9a; click for larger image. TND 9b; click for larger image. 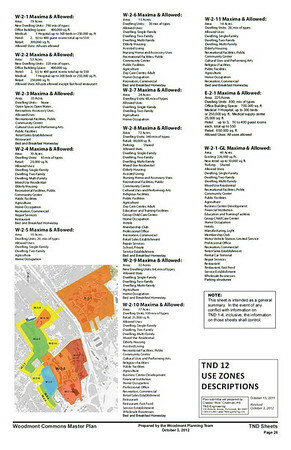 TND 10; click for larger image. TND 13; click for larger image. TND 14; click for larger image. TND 15; click for larger image. TND 16; click for larger image. TND 17; click for larger image. The newly generated traffic from the Project will be mitigated through an array of public and private investments in roadway and transit infrastructure in areas surrounding the site. The Town of Londonderry and NHDOT have proposed several short- and longterm improvement projects associated with their corridor studies and prior impact fee assessments. These projects include Route 93 Exit 4, Route 102 Upper and Central Corridor Improvements, and reconfiguration of Pillsbury Road / Gilcreast Road. Certain improvements may be necessary to safely and efficiently accommodate traffic in the future full-build scenario. As various phases are proposed during the Site Plan Review process, the Applicant’s team will prepare detailed traffic studies in general conformance with the Town’s or State’s standards. 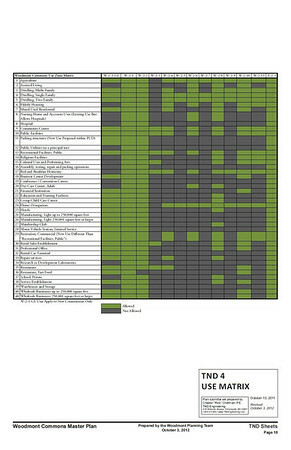 Each study will define the existing conditions and the mix of existing and proposed land uses, analyze shared trip credits and the impacts of the newly generated external vehicle trips, and propose any necessary project-related mitigation or the Project’s relationship to previously established Town or State capital improvement projects. New Garden Lane Connector Road – This project assumes a new north-south roadway connection between Garden Lane and Pillsbury Road, through property currently owned by DSM and Pillsbury Realty Development, LLC. The roadway is expected to be a mix of 4-lane and 5-lane cross-sections, with two general purpose lanes and occasional auxiliary turn lanes. It will transition in character as it moves from the W-2-1-GL zone into the dense village core of the W-2-1 zone, where on-street parking will be introduced. This new section of roadway may include one or more roundabouts to provide definition to access points for major land uses and traffic calming features at the gateways to the Project. It may also consider a new east-west connection of Garden Lane, near the current VIP Auto Parts, to provide additional space for queuing between Route 102 and the first major roadway or driveway intersection. The feasibility of this realignment will be contingent on reconfiguration of property lines, relocation of stormwater facilities, and various cross-access agreements. Nashua Road (Route 102) / Garden Lane – This intersection may require an additional lane on Garden Lane southbound as it approaches Route 102. This will allow the traffic movements to operate within their own lane. It may also include additional widening work consistent with the Town’s Route 102 Central Corridor Improvements. Nashua Road (Route 102) / Gilcreast Road – This intersection may require the construction of an additional left-turn lane on both Route 102 eastbound and Gilcreast Road southbound. Other improvements should be advanced by the Town as part of the Route 102 Central Corridor Improvements. Nashua Road (Route 102) / Londonderry Road / St. Charles Street – Route 102, east of the Route 93 interchange, will be widened by NHDOT as part of the pending interchange improvements. This same section of roadway is part of the Town’s Route 102 Upper Corridor Improvements. The improvements should consider separate left- and right-turn lanes on Londonderry Road southbound and potential signalization. Ash Street / Londonderry Road – This intersection will be partially reconstructed as part of NHDOT’s pending widening work and bridge reconstruction along Route 93. This work should consider auxiliary turn lanes on Ash Street and accommodate a future fourth leg of the intersection as part of the Project. Future traffic studies may examine the warranting condition for the installation of a traffic signal. Ash Street Extension / North High Street – Motorists traveling east on Ash Street Extension currently experience peak-hour delays attempting to turn left. The proposed Exit 4A interchange is expected to significantly reduce traffic on Ash Street Extension. 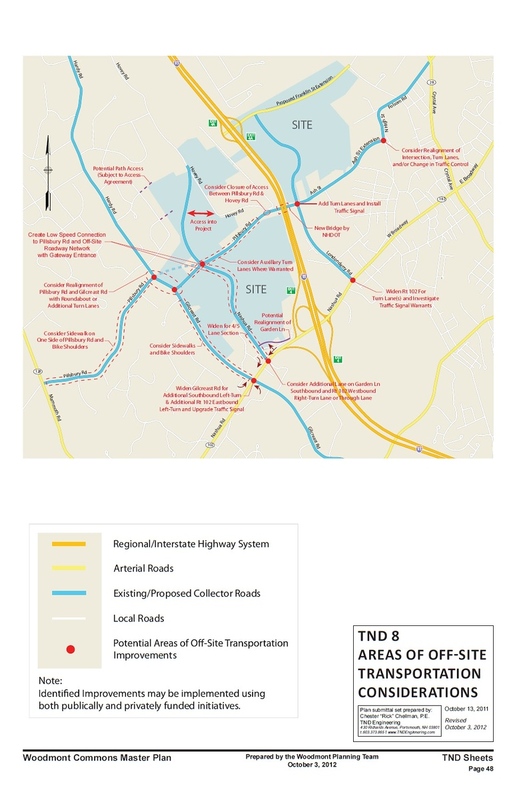 Future traffic studies may examine whether a change in intersection alignment or traffic control is warranted based on the expected redistribution of traffic associated with Exit 4A and new traffic associated with the Project. Pillsbury Road / Gilcreast Road / Hardy Road – This cluster of intersections has been the subject of several prior traffic studies by the Town and nearby private developers. 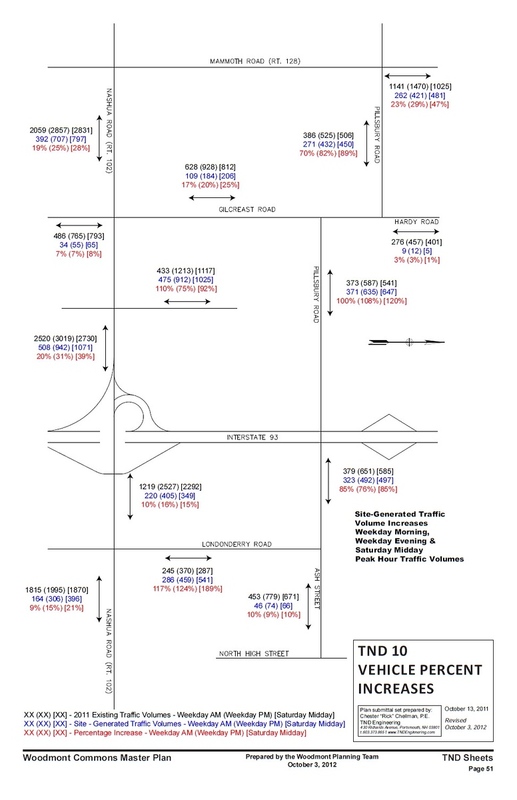 The Town previously collected impact fees to address a long-term improvement for additional turn lanes and modifications to the traffic control. 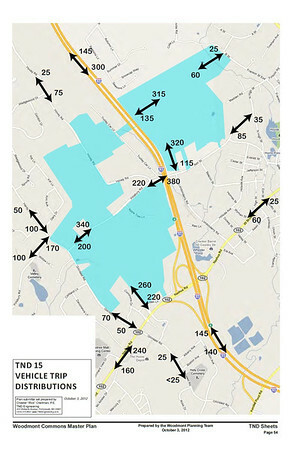 As part of traffic studies during the Site Plan Review process, the Applicant will analyze the appropriateness of the Town’s established plans and may consider alternative alignments of the roadways to accommodate future growth and new connections to the Project, Route 102, and Londonderry Road. 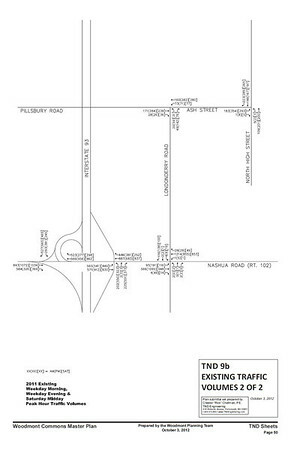 Pillsbury Road (through Project) – The horizontal and vertical alignment of Pillsbury Road through the Project may be modified to accommodate the new Connector Road from Garden Lane and other new roadways that are expected to extend further to the north. The design of Pillsbury Road in this area should consider auxiliary turn lanes, where warranted, as well as pedestrian and bicycle facilities. This roadway, once improved, is expected to remain a publicly-owned and maintained facility. 1. Separation of Parking Costs – All off-street parking spaces for new multi-family projects, or in future new conversions of multifamily projects, may be leased or sold separately from the rental or purchase fees for the life of the units if approved by the Board through the permitting process, such that potential renters or buyers have the option of renting or buying at a price lower than would be the case if there were a single price for both the unit and the parking space. v. Information on walking to work, pedestrian safety, and walking shoe information. a)The owner or representative of all new developments or businesses generating twenty-five or more employees may, when applying for a Building or Occupancy Permit, prepare and submit a trip reduction plan to reduce work-related vehicle trips from the number of trips related to the project as indicated in the most current edition of the Trip Generation Handbook published by the Institute of Traffic Engineers (ITE). xviii. Plans and facilities for centralized deliveries of goods for multi-tenant facilities. c) For new developments, trip reduction plans shall be submitted to the Code Enforcement Officer before the Town will issue a certificate of occupancy for the development. Should the Applicant and the Code Enforcement Officer fail to reach agreement on the trip reduction plan, the owner or representative of the development or business may file an appeal to the Board. An Applicant preparing a trip reduction plan is allowed to reduce the amount of parking that would otherwise be required without the trip reduction plan. Specific Requirement: Proposed open space areas. The Project will have a variety of Open Spaces that remain natural as well as other open spaces that may be planted or developed in the form of parks, squares, open water and Greens. Green and Open Space requirements shall be considered for the entirety of the Project, not individual parcels. Also see TND 1. Specific Requirement: Natural and cultural resources proposed to be preserved. The Project has few stone walls within the Woodmont Commons Project area. Some open space areas may be considered as natural resources and buffers. See TND 1. Specific Requirement: Proposed buffers, if appropriate, to adjoining property. In certain areas, such as along Gilcreast Road, some apple trees will be used as a vegetation buffer. Elsewhere around the site a buffer of at least 50’ will be preserved from adjacent residential properties. Please see TND 18. Specific Requirement: Sketch/plan of proposed landscaping. The landscaping within the PUD will be consistent with the purposes and all applicable regulations for the open space and buffer areas described in 10. Open Space (2.8.9.2.10) and 12. Buffers (2.8.9.2.12). Please see TND 19. The landscaping along the streets and travelled ways that will compose the PUD will be consistent with the general characterization of trees, landscaped medians, margins and setbacks indicated in Appendix 3 Woodmont Commons Streets Specifications and Palette. Landscaping within parking areas will be consistent with Town of Londonderry standards, unless alternate landscape approaches are proposed by the developer and deemed to provide the same or better levels of aesthetic and environmental value by the Londonderry site plan Permit Granting Authority. Street trees shall be planted within the street Right-of-Way generally and approximately as are illustrated in the Woodmont Commons Streets Specifications and Palette in Appendix 3. However, street trees may be shifted or eliminated along any street section as long as the number trees equals an average spacing of fifty (50) feet on center. Trees shall not be required along sides of streets abutting tree preservation areas or parks where internal trees are planted and visible from the street. Landscaping may be laid out in formal rows or informal drifts. Plant material located within 20 feet of any road or other paved area will generally consist of species which are tolerant of roadway deicing salts and otherwise planted and maintained so as to maintain a pleasing public realm. Landscaping shall be designed so that it does not substantially interfere with vehicular or pedestrian sight distances as to create a public safety hazard. TND 19; click for larger image. Specific Requirement: Brief explanation or sketch of proposed water and sewer/septic systems. All potable water and sewage disposal systems shall be provided by either Manchester Water Works, Derry Municipal Water, or Pennichuck Water (or equivalent) and municipal sewer systems determined by the Board to be reasonably consistent with the capacity of the Town’s water and sewer infrastructure. All parcels and dwellings in the Project shall be serviced by public water and sewer. Woodmont Commons is a large project that is expected to be built out over several decades. The Applicant will be making very significant and substantial investments in infrastructure and developmental improvements throughout the development of the Project. In order to estimate the amounts of water to be consumed and sewage flows to be disposed for each phase of development, the Environmental Protection Agency’s publication EPA 625/R-00/008-Chapter 3 is incorporated by reference as general information in support of this section. The calculations for water consumption and sewage disposal are to be considered equal for planning purposes and at standard rates used by the New Hampshire Department of Environmental Services (NHDES). The Board shall receive estimates of proposed flows for uses not listed by the NHDES, and for populations, customers, seats and the like if based on data from similar projects and uses. In later phases of the Project, metered flows from earlier phases of the Project shall be accepted as demonstrative of sewer and water use for similar uses. The Applicant shall not be granted any certificate of occupancy for buildings which, if occupied, would exceed the capacity of the public water supply or sewage disposal systems. However there shall be no restriction on the number of units or amount of development that may receive Master Plan approval from the Board based on water supply or sewage disposal capacities of the available facilities. Public water supply and sewage disposal remain required parts of the Project. Based on discussions with Manchester Water Works (MWW), who manages the source of potable water for the project area, there is adequate capacity to accommodate the proposed development. With the 2006 upgrades to the MWW facilities, the water treatment plant has the capacity to treat up to 40 million gallons per day (MGD) of high-quality water. The treatment facility has a current average demand of approximately 17.5 MGD with high use days reaching 28 to 29 MGD. This results in significant reserve capacity. Based on their distribution maps, the Woodmont Commons project lies within the franchise area controlled by Pennichuck Water Works, who distributes water using a supply that Manchester Water Works provides along Route 28, Old Derry Road, Wilson Road, and other locations in Londonderry. The source of MWW’s water is Lake Massabesic in Manchester and has a “safe yield” of 20.5 MGD. The southeasterly limit of MWW’s infrastructure terminates along Route 28 at the Londonderry/Derry town line, but also extends along Coteville Road in Londonderry near the town line. South of there, the infrastructure is controlled by the Town of Derry. There are several potential locations to connect to the Woodmont Commons project through an extension of the Pennichuck Water Works and Town of Derry infrastructure. See Appendix 9 for a copy of the recent correspondence from MWW. Project team members also discussed the project with representatives of Pennichuck Water Works (PWW), who maintains water mains along Route 102, Garden Lane, and Gilcreast Road on the southerly and westerly edges of the PUD. As part of the infrastructure planning for the project, project team members will continue to meet with PWW to identify water line loops, booster stations, and reserve water tower needs. As part of the broader public benefit of the PUD proposal, the Proponent will investigate the feasibility of providing a water loop between the east and west sides of Interstate 93 as an element of flexibility for regional access to the water supply. As each phase of the project is proposed, the water line network will be configured to create redundancy in the event of a failed line. Water gates will be positioned at each leg of intersections and key loops through development pads in order to isolate sections of pipe for maintenance. During each phase of site plan review, and as part of calculable needs that may be identified by specific tenants, the Proponent will commission a study of the water distribution system. In the event that the system requires additional storage to better distribute the water demand for the project over a typical day, or requires additional improvements to the hydraulic grade line (water pressure), the Proponent will consider a water tower near the northerly end of the site where the elevation is the highest. There is adequate reserve capacity to treat wastewater that is generated by the PUD. The project team coordinated with the Town of Derry Wastewater Department to better understand the capacity of the Derry Wastewater Treatment Plant, located southeast of the I-93 Exit 4 Interchange. The wastewater treatment facility currently has capacity to treat 3.0 million gallons per day (MGD) based on the current lagoon operations, treatment methods, and permits. The treatment capacity can extend to 4.0 MGD with the use of one of the supplemental lagoons at the treatment facility. The treatment facility has a current average demand of approximately only 1.6 to 1.8 MGD, which results in significant reserve capacity. The balance of the treatment capacity is apportioned on a first-come, first-serve basis. See Appendix 9 for a copy of the recent correspondence from The Town of Derry Department of Public Works. The treatment of flows from the Town of Londonderry falls under an existing intermunicipal agreement between the two towns. Derry’s facility currently treats approximately 80,000 to 100,000 gallons per day, or 0.08 to 0.10 MGD, from the Town of Londonderry. The Proponent will work with the two towns as specific phases of the project are proposed. A new agreement will be required with the Town of Londonderry if the demand from Londonderry exceeds the current cap. 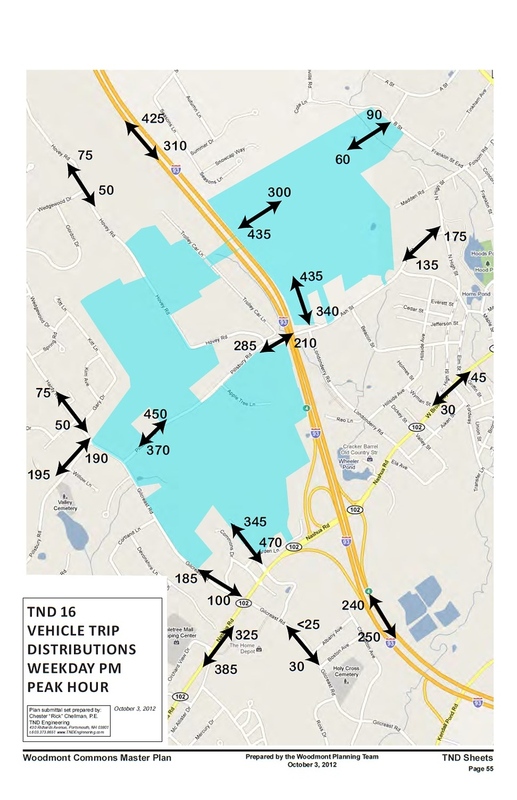 Due to the topography of the PUD site on both sides of Interstate 93, the sanitary sewer flows are likely going to be conveyed by gravity in primary interceptors from north to south. There may be portions of the development on the east side of Interstate 93 that will require force mains to connect to existing facilities along Londonderry Road or Route 28. Any low lying residences or businesses will have private pumps to discharge their wastewater into the trunk lines. However, these are expected to be limited in number and will be identified in each particular phase. 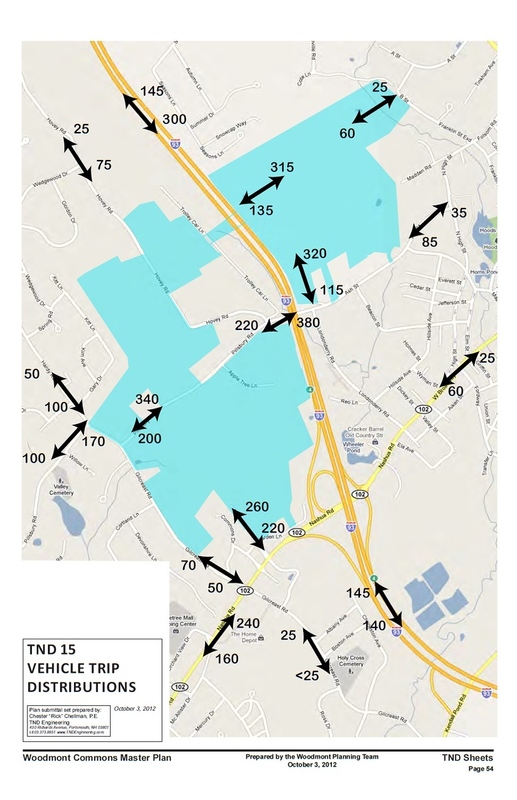 Most of the wastewater from the west side of Interstate 93 will be conveyed to the low point in the system along Charleston Avenue and pumped to the other side of the highway to the wastewater treatment plant. As part of the first phase of the PUD, the Proponent will evaluate the capacity of the Gilcreast Road and Charleston Avenue piping network to identify any short- and long-term improvements that may be necessary to upsize the pipes to accommodate the additional flow from the PUD. 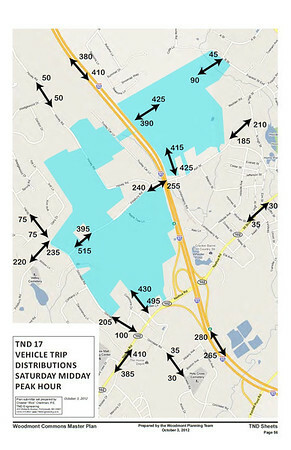 Most of the wastewater on the east side of Interstate 93 will be conveyed by gravity in existing and proposed pipes along Ash Street and Londonderry Road, with a lesser volume expected to be pumped from the A Street pump station, which lies to the east of the PUD in the existing industrial park. Specific Requirement: Brief explanation or sketch of proposed stormwater management plan. The overall stormwater management plan is to provide on-site detention and retention so that the rate of stormwater flow leaving the Project post development is equivalent to, or less than, the stormwater presently leaving the Project. The proposed pond area on W-2-3 will, if constructed as now conceived, form a part of this stormwater management strategy. The Project shall provide for proper surface drainage so that conveyance of surface waters will not adversely affect neighboring properties or the public storm water system and will help prevent flooding, erosion and sedimentation. The Project’s drainage systems shall be designed so that the post development runoff rate outside the Project does not exceed the pre-development runoff rate. Detention/retention areas may be used to achieve this requirement. Underground detention structures are permitted in the Project. Surface water runoff shall be carried away in a system of swales, drainage ways, culverts and channels to a natural watercourse or existing drainage facilities, as the same are regulated by the State of New Hampshire Department of Environmental Services. Where a site is traversed by a watercourse, drainage way, channel or stream serving another property or properties, an easement may be provided ensuring the ongoing use and maintenance of such watercourse. All culverts or other drainage facilities shall at least be large enough to accommodate 25-year design storms. Design Computations – A drainage study shall be submitted for review in connection with Site Plan Review, unless a proposal will have de minimis or no drainage impact. A drainage study shall include the same items in the Town’s Site Plan Review Regulations, Section 3.07. Driveway Culverts – The location, length, size, material, bedding and backfill of any driveway culverts proposed for an existing Town road shall be approved by the Town prior to construction. The Applicant’s engineers shall design all proposed driveway and other culverts in the Project. The hydrology of the project site will be analyzed at a primary discharge point such as the pond located at the southwesterly project limit. The pre-development and post-development conditions will be analyzed so that the post-development discharge rate does not exceed the pre-development discharge rate to the greatest extent possible. Watershed area plans will be provided to depict the pre-development and post-development runoff areas for the project site. Watershed soil characteristics will be determined in accordance with the Soil Conservation Service. The hydrologic analysis will be designed for the 50-year storm event and all calculations will be provided in an acceptable format to the Town Engineer. The hydraulics of the project site will be analyzed for all open channels, swales, cross culverts and closed drainage systems to check the capacity of a 25-year storm event. All capacity analysis will be performed in accordance with The Manual on Drainage for Highways – NH Department of Transportation. The hydraulic analysis calculations shall be provided and summarized for each element of the drainage system in an acceptable format to the Town Engineer. The overall objectives of the stormwater management plan are to control, convey, and treat stormwater to improve the quality of runoff and prevent downstream flooding and erosion and sedimentation. The stormwater management plan will utilize a mix of Low Impact Design (LID) and convention stormwater best management practices (BMPs) to achieve the objectives of the plan. Examples of LID BMPs may include bioretention/rain garden areas, water quality swales, vegetated buffer strips, tree box filters, or other treatment facilities designed to mimic the natural stormwater treatment and filtration process. Examples of conventional BMPs may include sediment forebays, detention/retention basins, water quality units, underground detention/infiltration chambers, and deep sump hooded catch basins. Stormwater Management Facilities will be designed to treat runoff and reduce peak runoff rates from the pre-development condition. Stormwater Management Facilities will be sized in accordance with Town and State standards. The proposed pond area on W-2-3 will, if constructed, form a part of this stormwater management strategy. In 2008 the New Hampshire Department of Environmental Services published a Total Maximum Daily Load (TMDL) study for chlorides for watershed in the I-93 Corridor including the Beaver Brook Watershed. The TMDL estimated that more than 90% of the chloride loads in the Beaver Brook watershed and in adjacent watersheds derived from road salt usage for deicing of roadways and parking areas. In the Beaver Brook Watershed approximately 47% of the chloride loads were attributable to deicing activities in private parking lots and 46% could be attributed to deicing of roadways. In response to these findings Woodmont Commons will cooperate with the Towns of Londonderry and Derry and the State of New Hampshire to continue source reduction best management practices as defined in the New Hampshire Department of Transportation’s TMDL Chloride Implementation Plan. In addition, Woodmont Commons will also explore additional source reduction and chloride abatement practices where applicable for common parking areas and sidewalks. These practices may include geothermal hydronic assist for large areas such as parking lots or boiler assist hydronic and embedded electric radiant snow melt systems for sidewalks and common areas. In problem sidewalk and common area locations where persistent icing hazards require the use of deicing agents, such as cold pockets, northern exposures, and persistent fetch areas, Woodmont Commons may consider incorporating chloride bioremediation species into rain garden areas. Red Fescue Festuca rubra L.
Drainage studies for all hydrologic, hydraulic and water quality analysis shall be submitted for review in accordance with all Town and State standards. The drainage studies shall include all requirements outlined in the Town’s Site Plan Review Regulations, Section 3.07 and with the NH Department of Environmental Services AoT Permit Application, or its successor. Specific Requirement: Brief explanation or sketch of other proposed utilities. The Project is expected to include, without limitation, cable television, telecommunications lines, gas, and electrical power lines, and other traditional utilities. In addition, there may also co-generation facilities that may provide means of melting snow and ice using buried heating lines of various types or other methods available under streets, sidewalks, and parking areas. All utilities shall generally be located underground and at any location within street and alley Rights-of-Way that is consistent with state or national public health safety requirements. Utilities are also permitted underground elsewhere within easements. All utility outlets, service entrances, transformers and the like shall be clustered, where practicable, to mitigate visual impacts and screen equipment from view where permitted by Building and Electrical codes. Outdoor lighting in the Project shall consist primarily of pedestrian-scale Streetlights. Significant public or civic buildings may be illuminated with spotlights. Commercial and mixed-use buildings may have building-mounted lights directed to the ground to “wash” parts of the building with light. Building-mounted lighting on porches, garages and the like is also expected to augment the lighting in the Project. Lighting shall be consistent with the intent of the Master Plan. Wireless communication systems and apparatus are permitted in E-1. It is the Applicant’s intent to preserve the existing wireless facilities located on E-1, and no setbacks from these facilities shall apply. Specific Requirement: Brief explanation or sketch of proposed firefighting strategy. Most of the larger buildings in the Project will have sprinkler systems, either wet or dry. In addition, hydrants will be well-positioned and located throughout the Project to provide firefighting access to credible sources of fire-fighting water. It is also anticipated that as the Project reaches future, near build-out conditions, that some firefighting apparatus may be located on site- on either or both sides of Route 93. As each phase of the project is proposed, the water line network will be configured to create redundancy in the event of a failed line. Water gates will be positioned at each leg of intersections and key loops through development pads in order to isolate sections of pipe for maintenance. During each phase of site plan review, and as part of calculable needs that may be identified by specific tenants, the Proponent will commission a study of the water distribution system. In the event that the system requires additional storage to better distribute the water demand for the project over a typical day, or requires additional improvements to the hydraulic grade line (water pressure) for fire flow, the Proponent will consider constructing a water tower near the northerly end of the site where the elevation is the highest. Fire hydrants will be located with reference to the National Fire Protection Association (NFPA) guidelines and will consultation with the Londonderry and Derry Fire Departments as a site plan is prepared for each phase of the PUD. Specific Requirement: Proposed architectural standards or guidelines or brief explanation/sketch of architectural treatment. Woodmont Commons is intended to emulate the good characteristics of traditional and walkable New England communities. The Applicant submits that an attempt to prepare arithmetic or geometric or other strict definitions of style would be unduly complicated and counterproductive. For that reason, and because of the power of images to communicate a great deal of information, the images contained throughout this document together with the following images are intended to convey the styles of private buildings to be constructed. Civic buildings should convey their purpose and civic nature as a part of the structure’s design. Note that some images depict overhead wires, which are not generally considered to be a part of the Project. Specific Requirement: A “Signage Plan” shall be submitted, this document shall establish guidelines regulating and coordinating all signage within the PUD, including general representations of tenant signage, development signage, directional signage, and vehicular and pedestrian traffic circulation signage. Specific criteria for design, size, proposed sign types (wall, free standing, etc. ), materials, heights, colors, setbacks, projections and contextual issues shall be established. Any other sign design information as required by the Town shall also be provided. The Signage Plan is provided in Appendix 4. Specific Requirement: Proposed time schedule for completion of the project, phasing schedule (if applicable depending on the scale and type of PUD), plans for bonding if applicable, and well thought out plan to ensure that the amenities will be completed as proposed and in a timely manner. The Applicant desires to commence development of its first phases immediately. Future phases and the timing and mix of future phases of development will be determined by prevailing market conditions and absorption rates. Also see TND 7. TND 7; click for larger image. Specific Requirement: Proposed covenants, restrictions and easements and how they will be monitored and enforced, if applicable. The Applicant’s needs for the covenants, restrictions and easements that the Project will require are not known at this time. Examples of such document are provided in Appendix 5 and are samples of what will be drafted when the necessary information to draft these documents has been gathered. Specific Requirement: Proposed ownership arrangement of each section of the Project whether to be subdivided, held in fee simple, owned under a condominium arrangement, etc. The Project will likely include various ownership forms, including: fee simple ownership; condominium ownership; zero-lot line ownership; leased land, structures or buildings; tenants at will; and buildings owned apart from the land they are on. At this stage, however, ownership structures are not known. Specific Requirement: Proposed articles of incorporation and bylaws of any corporation and/or association to be formed. While ownership structures are not known, formation documents will conform with New Hampshire law. The Articles of Formation for Pillsbury Realty Development, LLC are provided in Appendix 6. Specific Requirement: Miscellaneous Studies and Documents – The Planning Board shall have the authority to require the submittal of any additional information, studies, documents, etc. relative to the design, operations, or maintenance of the proposed project. A proposal for a Fiscal Impact Analysis from Development Planning and Financing Group, Inc. is included in Appendix 10. The full study will be commissioned, performed and delivered to the Planning Board during the review period and following a Board’s determination of completeness. Specific Requirement: Any other information that the Planning Board or the Town Attorney may deem reasonably necessary. Attorney Ramsdell has requested delivery of a means of waiving/modifying compliance with specified underlying development standards. As an element relevant to approval, this issue will be addressed between the attorneys and then submitted for the consideration of the Planning Board during the review period.